34 years ago I had my first listen to “Tales” in the backdrop of 1970s art-rock, Prog-rock, fusion, jazz, experimental, and of course the pop music of that period. The inventive music of that period influenced me to be a life-long musician. Upon hearing Tales during a radio broadcast in the winter of 1973, I looked forward to Yes delivering another Close to the Edge, Fragile, or Yes album. Tales was nothing like those albums, so I hated it until I began to question my need for constancy and convictions in my music listening. The critics state that Tales is pretentious, too long, over-done, has dense non-sense lyrics etc…and often compared Tales with “Tommy” rock opera by the Who, "Lamb Lies Down on Broadway" by Genesis, The Moody Blues stuff, Jesus Christ Superstar, or more absurdly, orchestral composers and Spinal Tap! All of this completely misses the point. The critics of Tales suffered from the age-old music listening problem: “They liked what they knew, but didn’t know what they liked. “ This premise is built on the historical example when “swing jazz” transitioned to “bop” Louis Armstrong (swing) said Charlie Parker (bop) was playing “the wrong notes.” Today “bop” has become mainstream musical vocabulary to the informed listener and musician. By the same token, Yes music (particularly 1970-1974) including Tales has become part of the mainstream musical vocabulary to the enlightened listener and musician. “Tales” From Topographic Oceans remains the most controversial works by both Yes fans and by their critics. First, “Tales” is music for grown ups. Second, this is music for mature persons that have a love for creativity, beauty, and eclectic marriages of extended musical developments. Tales is diverse music comprised of 4 separate, but intertwined 20-minute (average time) musical pieces. Yes’ collective as well as individual musicianship is beyond their musical peers and showed great maturity to deliver high ideals and low energy in the genre-bending recording. The sounds as well as the imagery of the lyrics are based on the four part Hindu Shastric concepts. As with any major musical developments, the making of Tales was filled with interpersonal conflicts within the band. As with most of the other Yes music, Jon Anderson is more concerned with his voice being an added instrument to the band and the sound of the words against the music than linear lyrics that are typically found in pop music. Jon also has the ability to turn a lyrical phrase at the same time a musical phrase has just completed itself. Examples are found in: The Revealing Science Of God Isolated Lyric: “a part we offer is our only freedom” Idea: “…an ever-opening flower in which simple truths emerge…” The Remembering” Isolated Lyric: “alternate tune” Idea: “…the nature of what is impressed on the mind, and how it is retained and used. The Ancient- Giants Under The Sun." Isolated Lyric: " Do the leaves of green stay greener through the autumn” Idea: “…The Ancient people left an immense treasure of knowledge probing still further into the past beyond the point of remembering…” "Ritual" Lyric::“Nous Sommes Du Soleil” Idea: “…freedom to learn and to know the ritual of life…” Anderson, Squire, and Howe provide unique and well-executed vocal harmonies throughout Tales, which separates Tales from all the “comparison music” of that time in of itself. Overall, the vocals are more of a feature than previous Yes recordings. Bill you must have been pretty high as Jon was only 29 at the time of this show. The tour book only says that he was born in 1944. 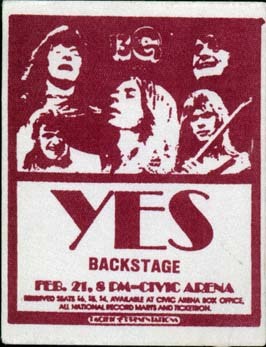 @1974 My first Yes concert..Civic Arena, Pittsburgh, PA,TFTO tour. They did the entire TFTO and CTTE. They used the underwater stage and tons of fog. It was a bitter winter's eve in the 'Burgh and about a dozen of us were headed off to see Yes for the very first time. Seventh row seats, consciousness-altering comestibles, and the promise of hearing the "muzak de la sfears" created much anticipation among our little cadre from New Brighton High School. Arriving at The Civic Arena and seeing the remarkable Tales stage set (and leafing through the beautiful black on black tourbook - which I vividly remember informed us that Jon was already 35 years old) increased the anticipation to a pitch that Mona apparently couldn't stand. His head tilted toward the floor and elbows on knees, he pinned his eyes to his boots as the houselights went down. Yes emerged from a huge pink conch shell onto a fog-shrouded "underwater" stage. Monitors covered to look like mossy rocks pulsed an eerie green. Manta ray wings in the canopy above White's Ludwigs flapped back and forth. Smoke issued from the spine of a whale's rib cage guarding Rick's Moogs, mellos, RMIs, Hammonds and grand piano. The band took their places and slammed into 'Siberian Khatru', then 'And You And I'. Compared to the rest of the effects, the mirror wheel that spun during 'Close to the Edge' was a little cheesy, but the music was sublime and Yes flooded the stage with ridiculous amounts of fog during "I Get Up..."
At various times throughout the first set, I nudged him, urging him to look at this wonder being displayed before us. He would shrug and shout through the music "I can SEE it!" Yet he never raised his head until the music stopped and the houselights came back up for intermission. Then he got up and walked with us to the concession area where we bought beers ("Are yunz guys 21?" "Yeah. Are you a unicorn?" "Yeah. Four beers - that'll be a buck-three-eighty.") and talked about what a great set it had been. Mona apparently believed he'd seen it all. Back downstairs for TFTO and he did it again - eyes nailed to the floor the second the band came on. Jon announced "We're gonna do the new album now. The WHOLE new album." And the place went nuts. Roger Dean's finest was displayed on the skate wings (now projection screens) over the drums. Steve spun a lazy-susan device that held three guitars (including a DanElectro!) with his knee as he alternated tones from his ES175. Jon smashed together concert cymbals on fixed arms, shook bells, and reached far into Alan's territory to tap a crotale in 'The Ancient'. And Chris - Chris was sublime. His harmony parts were perfect and the tone from his Rick/SVT combo was perfect. He even pulled out a jumbo acoustic bass toward the end of the set - quite a rarity for 1974! And Mona missed it all! As mellotron and steel guitar faded at the end of 'Ritual' and the crowd arose, only then did Mona look up. He stood and faced the darkened stage for the first time as flaming matchbooks and lighters invoked the band's return. His face was a mask of puzzled concentration as his addled mind attempted to make sense of the underwater seascape onstage. Then the conch shell began to pulse with pink light again signalling the band's return. One by one they emerged from the shell. Mona's anxiety became unbearable when Wakeman emerged last, his cape and long hair flowing to make him look like a bizarre version of Botticelli's Venus. As the big guy strode to the front center of the stage, Mona became terrified. Then it happened - Rick leered out at the audience and spread his cape as his arms raised to wave to us all. When his enormous paws spread out above us in greeting, Mona could stand no more. "He's going to KILL us," screamed Mona, and he slammed himself back down into his seat. He didn't raise his head until the band was long gone and the safety of the houselights returned. I can verify the Feb 21st Date for TALES as being in Pittsburgh PA, The Civic Arena. It was the same set list from the previous night show. Great Show.